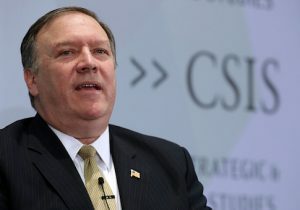 CIA Director Mike Pompeo said Thursday that the U.S. cruise missile strike on a Syrian airfield last week signaled to Iran that the United States is prepared to use force to protect American interests. In his first public remarks since taking over the intelligence agency, Pompeo also criticized the anti-secrecy website WikiLeaks, labeling the group a "hostile, non-government, intelligence service" and calling its founder, Julian Assange, a celebrity-seeking narcissist. On Iran, Pompeo linked last week's 59 Tomahawk missile salvo fired from a U.S. warship against an airfield in Syria where jets carrying chemical weapons took off prior to a recent nerve agent attack to Iran's compliance with an international nuclear accord. The CIA director said the agency is closely monitoring Iranian adherence to the nuclear agreement known as the Joint Comprehensive Plan of Action (JCPOA), including both declared and undeclared nuclear facilities. "We should all be mindful, given what took place in Syria, and go back and read that JCPOA when it talks about declared facilities and undeclared facilities and how much access the IAEA will have to each of those two very distinct groups," he said during remarks at the Center for Strategic and International Studies. Pompeo, concerned the comments may have been too blunt, then said he would clarify the comment. "What I mean by that is [the Syrian strike] was a decision making process that was decisive, thoughtful and truly based on a factual understanding of the geostrategic importance of the things that are facing our nation today," he said. The Obama administration adopted conciliatory policies toward Iran, such as failing to support anti-government protests in 2009 and playing down hostile Iranian activities in the region. The 2015 nuclear deal between Iran, the United States, Britain, Russia, France, China, Germany, and the European Union required Tehran to limit its nuclear program for 10 years in exchange for the lifting of international economic sanctions. Pompeo was a harsh critic of the Iran nuclear deal as a Republican member of Congress prior to becoming CIA director, including provisions of the accord that left key nuclear program-related facilities free from international monitoring. Under the agreement, Iran will be able to engage in high-technology nuclear development in 10 years. The CIA is working to follow whether Iran violates the agreement through covert nuclear activities. Pompeo said the agreement has not produced a more benign Iran, regarded as the world's most active sponsor of state terrorism. "With respect to the Iranians, they're on the march, whether it’s the enormous increased capacity to deliver missile systems into Israel from Hezbollah; their increased strength with Shia militias in Mosul; the work that they've done to support the Houthis [in Yemen] to fire missile against the Saudis," he said. "The list of Iranian transgressions has increased dramatically since the date that the JCPOA has been signed," Pompeo noted, adding that Iran is backing a "Shia crescent" in the Middle East that will not be favorable to U.S. interests. On the threat posed by groups such as WikiLeaks, Pompeo said he was speaking out against those engaged in the systematic theft of U.S. secrets "to make sure that the American people understood the threat that they pose to us." "Frankly I think the United States government has not done nearly enough to protect our nation, our cyber infrastructure, all the things that are at risk from those threats," he said. Nation states' intelligence threats have been the focus in the past but the new threat is operating in different manner "but has as its motive the destruction of America in the very same way as those nations do," he said. According to Pompeo, WikiLeaks is recruiting agents to join the CIA and leak secrets on ways foreign intelligence services operate to the group. "It is dangerous, and … I am confident that this administration will pursue them with great vigor," Pompeo said. Past administrations have been "squeamish" about pursuing WikiLeaks and similar anti-secrecy groups under what Pompeo said was a misguided notion they have First Amendment rights to publish. "These are not reporters trying to do good work, trying to keep the government honest," Pompeo said. "These are people who are recruiting agents to steal American secrets with the sole intent of destroying the American way of life. That is fundamentally different than a First Amendment activity as I understand and as most Americans understand it." "No one has the right to actively steal American secrets with the intent to do harm to it," he said. On North Korea, Pompeo said Pyongyang is pursuing development of a long-range missile capable of hitting the United States. The North Koreans are making progress toward their nuclear missile goal and are "certainly closer now than at any time in North Korea's history," he said. The threat has increased the danger that "you'll get a bad decision and a tough day from the leader of North Korea," he said. On Russian disinformation regarding Syria and its invasion of Ukraine, Pompeo said of Russian President Vladimir Putin, "This is a man for whom veracity doesn't translate into English."